For families with kids ages 6 to 12. Join us for an adventure and get hands-on with nature! Each class includes outdoor activities for your family to learn together about the plants and animals of the Shaw Nature Reserve while mastering a skill. Bundle up and enjoy a 2 mile hike on our River Trail. Winter is a great time to hike- leaf free views, no insects, neat ice formations, and more. We’ll learn about animals that live in the river bottom area, tracks, learn 5 native trees by their bark, visit the Meramec River, and end with hot chocolate. Please wear walking shoes and dress for the weather. Part/all of this class takes place outside. Bring a refillable water bottle. 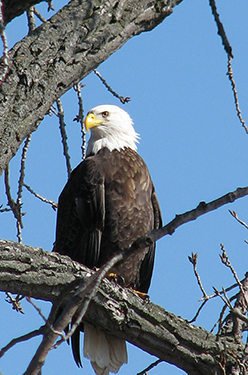 We might glimpse one of the resident eagles that live near the River Trail. Trail House at Shaw Nature Reserve. Come prepared for a two mile walk.